Horsetail (Equisetum arvense) is a perennial herb that also is known as shave grass and scouring rush. It contains very high levels of silica and has been used in herbal medicine for hundreds of years for its anti-inflammatory, diuretic and healing properties. It can be used to treat urinary tract infections and other health conditions in cats and dogs. Always check with your veterinarian before using herbal products to treat your pet. Horsetail herb is mainly used to treat urinary tract disorders including bladder infections, urinary incontinence and kidney stones in cats and dogs. When taken orally, the diuretic properties of the herb assist with water loss and relieve swelling due to excess accumulation of fluid in the body. It is best to administer as a tincture to dogs and as a cooled herbal tea for cats. Liquid horsetail products can be added to their food. 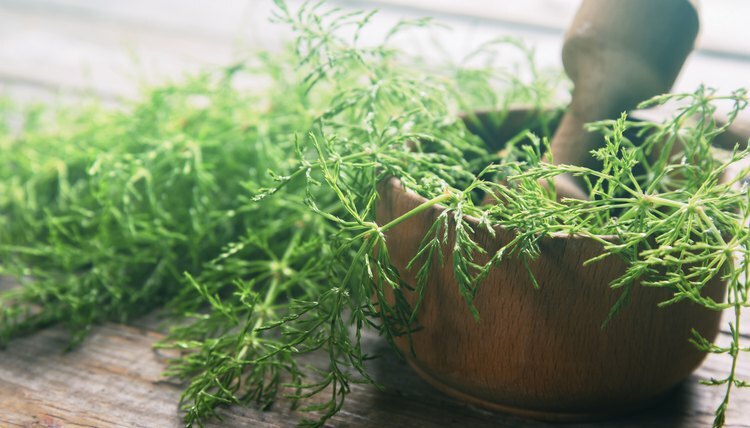 Horsetail can aid the healing of ligaments and broken bones, as silica is needed for the formation of collagen in bone, cartilage and connective tissue. Horsetail lotions have been developed for skin conditions such as eczema in dogs; horsetail-based gums and teeth preparations can treat mouth ulcers and bleeding gums in cats and dogs. Dr. Shawn Messonnier DVM, author of "The Natural Health Bible for Dogs and Cats," suggests using horsetail in older pets can help prevent degeneration of the nervous system and cognitive disorder.